Horti III is a high performance black plastic mulch film that provides closer contact with the soil for optimum heat transfer. Better reaction of the black plastic mulch film to expansion and contraction due to temperature variations. Superior strength that facilitates installation and removal. 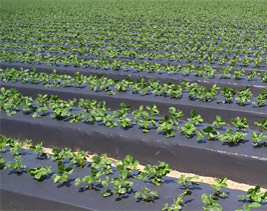 Black plastic mulch film is recommended for crops such as tomatoes, cucumbers, zucchinis, peppers, strawberries, raspberries, blueberries, grapes, etc.